It's famous for its cars, but Owl's Head also has antique bicycles, motorcycles...and even aircraft. Special exhibits bring in even more vehicles. The Owl's Head Transportation Museum near Rockland ME (map) is a wonderland for any technophile, with over 100 historic aircraft, automobiles, bicycles, motorcycles, carriages and engines in its permanent collection. The museum's oldest aircraft dates from 1804, its oldest automobile from 1885. My favorite flying machine—and there are dozens of planes here—is the 1900 Clark Ornithopter, a flying machine that flaps its wings like a bird. 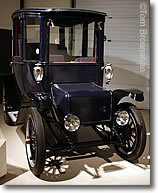 Among the autos, the 1912 Woods Electric Brougham is from the time a century ago when there were more electric cars than gasoline-powered cars on the road. But my all-time favorite has to be the 1935 Stout Scarab, "the first minivan," with innovations such as aerodynamic design, unibody construction, rear-mounted V-8 engine, electric door locks, and a configurable interior that included a card table and movable seats. The Owl's Head Transportation Museum, two miles (3 km) south of Rockland ME next to Knox County Airport and near Owl's Head Lighthouse (map), is open every day, all year, except for three major holidays. 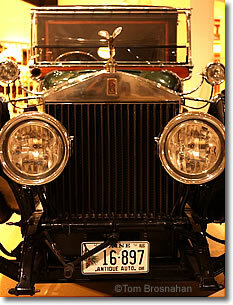 Here are other antique and classic car museums in New England. 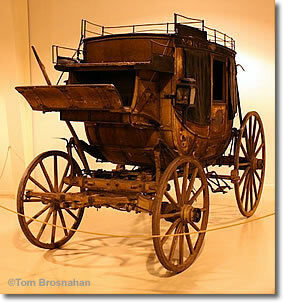 Below, a stagecoach on special exhibition.